We will be showcasing our popular dual-lift Gemini 1700 bath with new integrated antimicrobial BioCote technology at the next Occupational Therapy Adaptation Conference (OTAC). OTAC, Newcastle Gateshead Hilton, Bottle Bank, Gateshead, NE8 2AR. 28th Nov, 9am – 4pm. Stand 19. OTAC events provide invaluable information regarding housing adaptations and first-hand opportunities to see the latest assistive equipment. They also deliver a comprehensive seminar programme and CPD-accredited training. The Newcastle conference will offer benefits to Occupational Therapists, commissioners and construction professionals working in the housing sector, such as surveyors and architects. 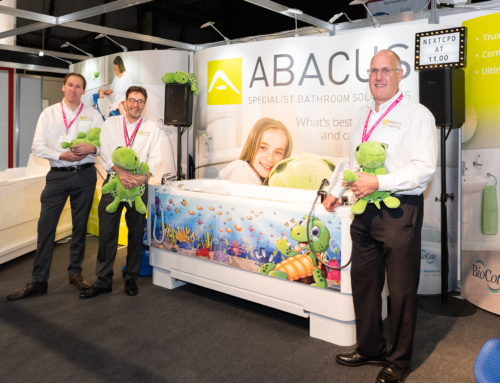 Part of the Gainsborough Healthcare Group, Abacus works closely with healthcare professionals, care providers, families and specifiers to deliver a complete assisted bathing service – from specification and manufacture through to install and after-sales care. Our proven range of specialist baths provide safe working heights for carers and allow bathers to enjoy a safe, pleasurable bathing experience. T he unique height-adjustable Gemini 1700 is a popular and reliable choice for OTs and families due to its integrated changing, drying and bathing platform. This dual-lift platform eliminates awkward moving and handling and ensures greater safety and comfort, for both carer and bather, through reduced bath transfers. We have just introduced the new larger and longer Gemini 2000 to our proven Abacus range, which is suitable for both paediatric and adult bathers. In addition, all Gemini baths now include antimicrobial BioCote infection-controlling technology. This proven silver-ion technology is integrated during the manufacturing process so cannot be wiped or worn away – hence providing 99.9% 24/7 protection against Superbugs such as Influenza H1N1, E.coli, Salmonella and antibiotic resistant MRSA. This ensures bather and carer hygiene, well-being and wellness is enhanced resulting in a more positive bathing experience. 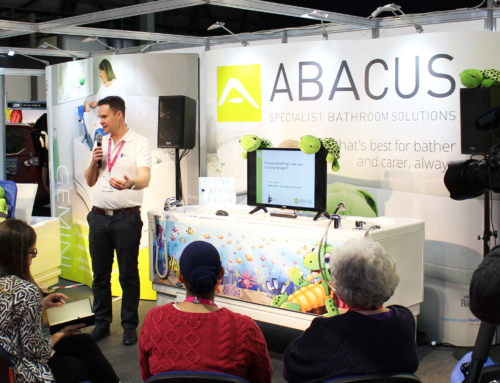 At OTAC Newcastle, Abacus Regional Assessment Managers will be available on stand 19 to provide product demonstrations and further information regarding our new assistive bathing products. Event delegates can also collect information regarding our free Abacus CPD-accredited educational seminars and “Lunch and Learn” practical safe assisted bathing workshops.